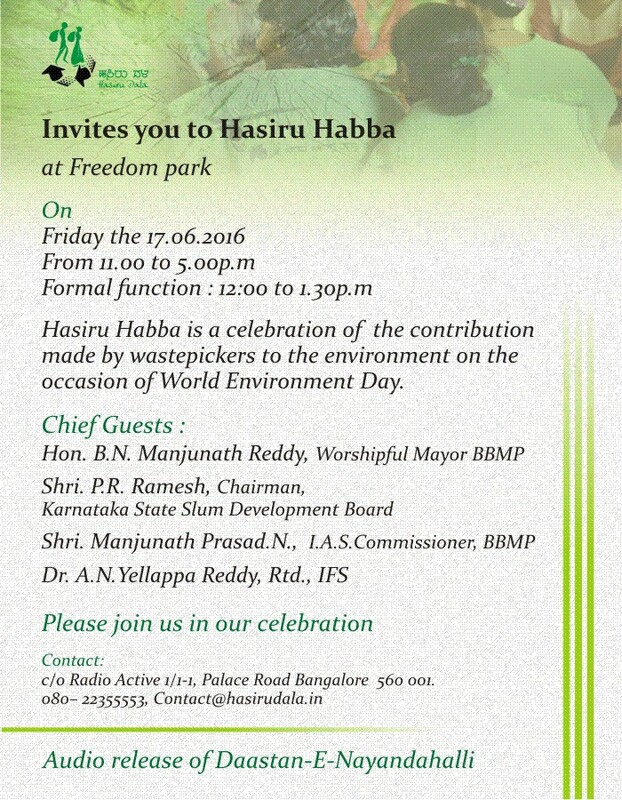 Hasiru Dala invites you for the Hasiru Habba, 2016 – an annual gathering of wastepickers and informal waste collectors from all over Bangalore and neighboring cities. More than a 1500 wastepickers and citizens will be participating to celebrate the occasion. This year the event is a lot more special as the recently notified waste management rules i.e. Solid Waste Management Rules, 2016 & Plastic Waste Management Rules, 2016, emphasize on inclusion and integration of wastepickers and informal waste collectors in waste management. Further, Hasiru Dala – wastepickers organization, has been rewarded with State Environment Award by Karnataka government for its contribution in making waste management sector efficient and robust. We will breaking the bread together and open. In additions to food, there will be stories of struggles and achievements, reflections and love will be there in the platter. The exhibition ‘Notes from Nayandahalli’ will be put out in public and ‘Daastan-e-Nayandahalli’, a radio series will be released during the event. The event will include a dialogue with elected representatives & Municipal authorities. Mr. Mr. B. N. Manjunath Reddy, worshipful Mayor of Bengaluru, T. Bissegowda, Commissioner, Karnataka Slum Development Board and, Mr. N. Manjunath Prasad, Commissioner, Bangalore will interact with wastepickers. For more information you can visit our website: www.hasirudalainnovations.com, www.wastenarratives.com and write to us at nalini.hasirudala@gmail.com, kabir.postbox@gmail.com or call +917829777737, +919663427315. You can walk in anytime during the day to be a part of celebration and also can RSVP for the event on the facebook page.